A tomato based cold soup with a spicy kick! 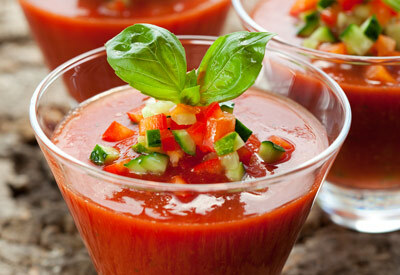 Blend the following using a standard blender or immersion blender: 1 1/2 cups vegetable juice, 1/2 of the cucumber, 1 tomato, granulated sugar, red wine vinegar and oil. Add the remaining vegetable juice, cucumber, tomato and red onion to the blender; stir to combine, but do not blend. Cover and chill. Serve very cold with an assortment of chopped garnishes - hard boiled egg whites, fresh green bell pepper, onion and cucumber. Finish with a sprig of fresh basil leaves.